Iron cross, a photo by The Bacher Family on Flickr. Sometimes a photo is all about texture and geometry. 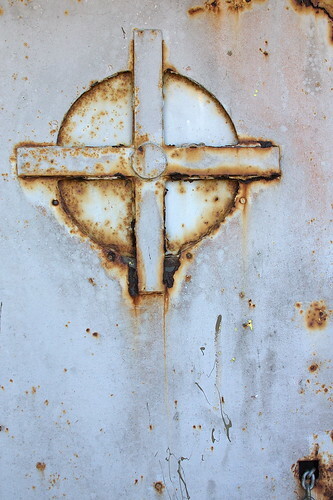 I took this picture at Fort Stevens State Park, and was attracted by the interesting patterns of rust and paint. The fun part was composing the picture in a way that the balance and composition was interesting; in the end, I chose to include just a hint of the chain in the lower right corner to balance the dominant geometry in the upper left. You'll notice that I haven't said what it's a picture of. Is that important, or is i just as good -- or better -- as a piece of abstract art? Hopefully it is that, first. But if you really want to know, it's one of the large iron doors to one of the bunkers next to the big batteries that defended the Columbia River. I'm not sure what mechanism is hidden inside the iron cross. But that's not important, is it?